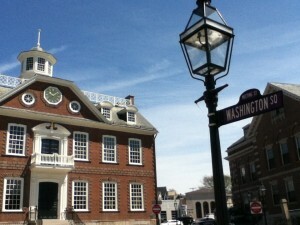 Newport, RI (April 2019) – The Newport Historical Society is pleased to announce the winning essays for its contest, Big Ideas for a Changing World: Write Your Way to Hamilton. High School sophomores from around the state wrestled with the questions: What is happening in your community, or could happen, that has the capacity to change Rhode Island or the world? The responses are a snapshot of what young people are observing, worrying about, and thinking regarding their futures. Essays addressed issues that might have been torn from the headlines: addiction, journalism, representation of indigenous people, technology and education, changing labor force, depression, empowering youth, immigration, disabilities, and the cost of higher education. Winning essays were compellingly argued, addressed a problem, and connected to our Rhode Island communities. Each is among the best of the submissions on the topic chosen. The students will travel to New York to see Hamilton, An American Musical, in May. Since 1854, the Newport Historical Society has collected and preserved the artifacts, photographs, documents, publications, and genealogical records that relate to the history of Newport County, to make these materials readily available for both research and enjoyment, and to act as a resource center for the education of the public about the history of Newport County, so that knowledge of the past may contribute to a fuller understanding of the present.